Barbecue is the quintessential Father’s Day meal. It’s sort of stereotypical “man food” – meat is featured heavily and depending on the heat of the sauce, the meal can also double as a test of stamina. Father’s Day is also a great time to make, rather than buy, your dad a gift. (How many neckties can one man own, anyway?) 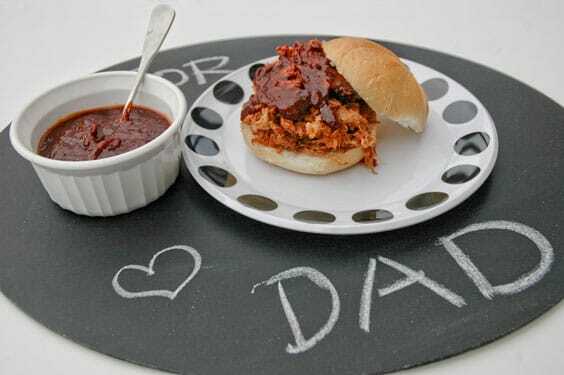 Homemade barbecue sauce is a perfect way to show your dad you care. I love barbecue, but I usually leave the making of the sauce to the experts. But for Father’s Day, I went in search of something I could make with my own two hands. I love all kinds of barbecue, but given my choice I’ll take a thick, sweet sauce over a thin, tangy sauce. I started with an ambitious recipe for a Kansas City-style sauce that featured puréed raisins and involved a long cooking time. I ended up with a disaster in my kitchen and a sauce that tasted a lot like burnt raisins. But the ingredients aren’t too expensive and I’m a firm believer that the first time you cook anything new, it’s smart to be prepared for a do-over. So, I washed the pots and pans and tried again with another complex recipe that started with tomato paste and listed lots of combinations of additives to be tailored to my taste. As it turns out, my taste doesn’t have good instincts as to what makes for good barbecue. In desperation, I searched one more time for something to add to our summer picnic lineup. What I found used ketchup as its base, which seemed like cheating, but I was getting a little weary. I took the recipe and made a few changes to the ingredients and then simmered it for ten minutes. The end result was a satisfying blend of sweet and savory, just what I was looking for. It was even better the next day after some time in the fridge. So whip up a batch of this sauce and put it in a fun container to give to your favorite dad. Or, light up the grill and serve this sauce with whatever your dad desires. It’s great with pork, beef, chicken or even French fries. Happy Father’s Day! The cheat here is to use ketchup – it’s a great base and allows you to alter the flavor any way you want without creating a giant hassle or mess in the kitchen. One recommendation: use good-quality organic ketchup as your base. It has the best flavor. Combine all ingredients in a saucepan and simmer on low heat for ten minutes, adding cayenne a pinch at a time and tasting along the way to achieve desired heat. Allow sauce to sit overnight in the fridge for flavors to combine.